This is a special post. Not because the album or the artist. No, far from. It's the one that celebrates this blog itself. Started in February 2012, this is the 1.000th entry. Something to celebrate shortly before you start reading the post itself. Hence our own logo first, for once. 2014 is the year that sees the re-release of the first five Led Zeppelin albums, all remastered and issued with a second cd with some extra goodies. On WoNoblog we focus on the original album and listen whether it stands the test of time. As 'House of the holy' was, unwittingly of the scheduled re-release, reviewed in January, we have only two to go after 'I' and 'II' earlier this fall. So let's go. Reading up on 'III' it is quite clear that this album was not what fans expected at the time and set the band slightly back. It reached the #1 spot in many countries, but did not have the impact the previous two albums had. Too acoustic, too Crosby, Stills & Nash even. As strange as it may sound to our 2014 ears, this was a comment I ran into. Written on a hill top in Wales, in an 18th century cottage without basic facilities, Plant and Page had, for lack of electricity been dabbing in acoustics and came back to Jones and Bonham with a handful of acoustic songs. And a few things else as well. A better description is of course, with my 2014 ears on and listening intensely to 'I' and 'II' recently, that Led Zeppelin explored some avenues, it had already visited, a little better, deeper and wined and dined the neighbours as well. The other side of Led Zep just came out more prominently.What made them the legends they were about to become in 1970. There's no doubt that Led Zeppelin III kicks of with one of the best rock singles and rock songs in general. 'Immigrant song' is propelled forward by that driving rhythm. That whine, that Arctic wind coming from the lungs of Robert Plant, singing at their very top. The tape hiss announcing something will happen, with a faint sound coming through the hiss, before the beast is let loose. The rhythm is loud, propulsive and still delicate. There's a lot not played in the lot that is. So tight and accurate. And in less than 2,30 minutes it's all over. One of my favourite rock songs? You bet! The classic rock of 'Immigrant song' is said goodbye and 'Friends' enters the arena. 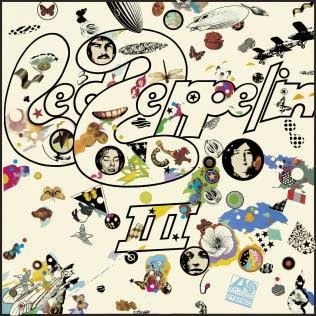 Music that was only hinted faintly at on 'II', is introduced to Led Zep fans. British folk, acoustic guitars played with a fierce stroke. Later on in the song, another new influence is introduced: oriental melodies. With 'Friends' another of the epic Led Zeppelin sounds gets its debut, oriental folk mixed with some rock influences and droning sounds. In the fourth song the band goes all out and holds back in all the right places. 'Since I've been loving you' in my opinion is simply the best blues song ever released by an all white guy band and a long way with the rest. Mixed in the background is John Paul Jones playing the Hammond organ. All these warm sounds coming out. The track has a few irregularities from the 12 bar blues, that make it just this little more interesting. If anything Led Zeppelin III is the album containing this fabulous blues song. Jimmy Page plays it all here and everything the band did up to that date in blues culminated into this song. Robert Plant is at best 22 when he recorded this song and sings like he's carrying the weight of the whole world on his shoulders. There's no other blues song like this one. The way the tension builds, the way it is released and recaptured is just magnificent. Every time I hear it, it has me. What a song! After the end of 'Since I've been loving you' there is nothing else. It should have been the last song of 'III'. 'Out on the tiles' is nothing but an anti-climax. To really do it honour I have to start listening to 'III' with that song or skip #4. The riff is reminiscent of 'Heartbreaker'. A long riff, but slightly simpler. Led Zep rocks out in a slightly routine way. The change at the end, the rhythm guitar part, works really well and certainly lifts the song upwards. More folk. 'Gallows pole' is a traditional, starting as a traditional with acoustic guitar and a banjo, but in the end rocks out anyway. Bonham kicks in his drums and Page let's it rip, while someone is "swinging from the gallows pole". 'Tangerine' is also acoustic, but of that other variety. The Led Zeppelin ballad. (Have The Rolling Stones nicked a lick here for 'Angie'? It does sound like it.) A short song, with a hint at a great chorus, it makes me feel as if it was not really completed. As if a little more time would have made 'Tangerine' a great song instead of a nice one. The psychedelia sauce over the sound makes it stand out just a little bit more. 'That's the way' is lauded as Robert Plant's breakthrough as a lyricist. That may be so, but it is because of the mandolins and the acoustic guitar laying down this fine, simple sounding melody over which Plant excels. That is what makes 'That's the way' such a nice song. Again Plant is truly singing, not needing any form of antics. On the side. Imagine the hard drinking, Animal drummer with Christmas bells in the background. 'Bron-y-our stomp', named after the Welsh cottage mentioned above, is another acoustic song. Something like a(n uptempo) footstomping blues. The song swings and again so different from what this band did before. It totally works. Castanets? Why not. It all ends with 'Hats off to (Roy) Harper', another traditional blues song. With Page playing a national steel, I think, sliding away too. Plant singing with distortion on his voice. Just the two, each in one corner of the mix. Again a showcase how good the two had become, come 1970.